Accompanied by acting deputy program manager of SDUW program, Ellen Hao, a delegation from University of Royal Melbourne Institute of Technology University (RMIT) led by Mr. Jonathan Pratt, regional manager of RMIT visited SDUW.Prof.Liu Ruolun, Vice Dean of school of mechanical, electrical and information engineering, SDUW, together with relevant staff from school and International Office met with the delegation. 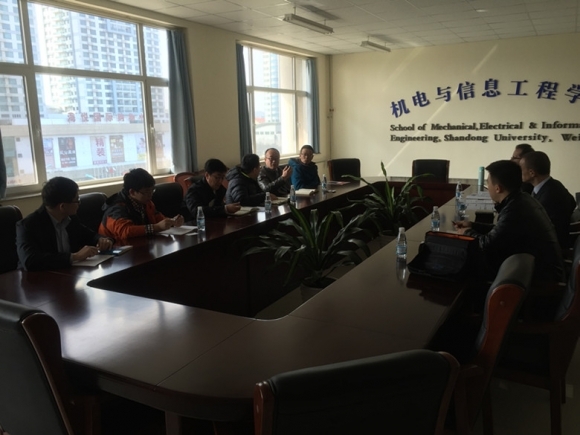 Liu Ruolun warmly welcomed the delegation from RMIT and gave a high appraisal to the development of the programs between RMIT and SDWU during the recent two years; also he gave some suggestions about the teaching plan for the development of the Mechanical Engineering cooperation program. He hoped that RMIT will appoint more qualified teachers to SDUW to teach and both sides will promote teachers’ exchange and interaction between the two universities. Mr. Jonathan Pratt and Prof. Reza N. Jazar expressed their pleasure to visit SDUW again and said the successful cooperation of the two universities in Mechanical Engineering major is the result of joint efforts of both sides, and for further deepening cooperation, both sides need to play positive roles in promoting the program. In addition, they also discussed about the continuing in-depth cooperation in the MoE program and Joint PhD program. During the visit, Mr. Jonathan Pratt and Prof. Reza N. Jazar met with the Mechanical Engineering major students and introduce RMIT School of Mechanical and automotive engineering and answering students’ questions.